Info "Whatever you do, don’t shoot the puck into your own goal." Airhead is one of Penny's Microgames in WarioWare: Smooth Moves. Its name is a pun on "airhead". 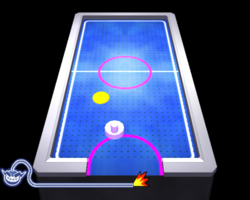 The player has to defend his goal from the pucks. 1st level difficulty: Defend against one puck. 2nd level difficulty: Defend against two pucks. 3rd level difficulty: Score a goal (not one's own). This page was last edited on February 20, 2018, at 16:23.